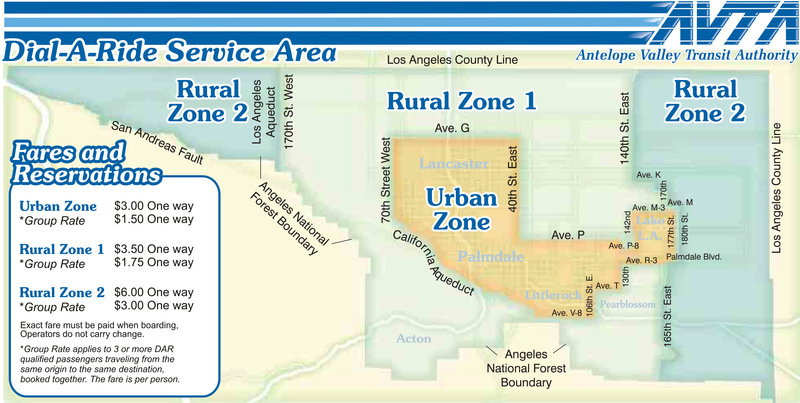 Dial-A-Ride (DAR) provides curb to curb transportation service to residents of the Antelope Valley who live within the Los Angeles County area. Eligibility is determined based on residency, age, or disability. DAR is available to the general public for those who live in Rural Zone 2. Please refer to the DAR map below for reference. Note: If you do not have a Reduced Fare TAP Card, you must apply for one in order to qualify for Dial-A-Ride Services. Please contact 661-945-9445 for more information. If you believe you have a physical or mental impairment that prevents you from independently using the ADA accessible fixed route bus service, complete and return the eligibility application to AVTA. An application can be obtained at the AVTA facility located at 42210 6th Street West in Lancaster. Once eligibility has been determined, a photo I.D. will be issued which will be required to use the service.